Why are we dying for Black Friday with Cyber Monday right around the corner? 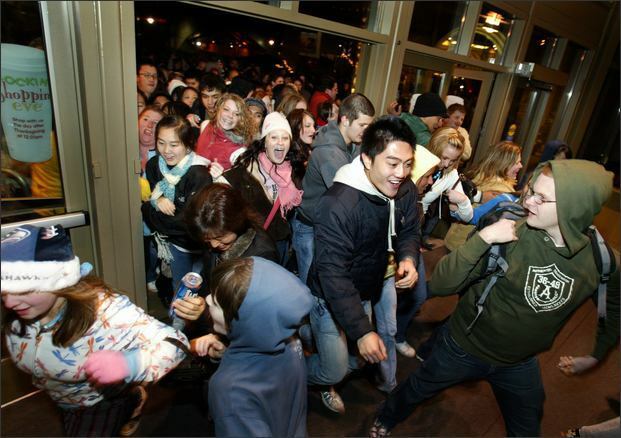 The source link provides a gruesome list of Black Friday related injuries and deaths. One of the deaths is of a teen who fell asleep at the wheel on the way home from a day of Black Friday shopping. She probably stayed up all night to be the first in line, and literally shopped till she dropped. Another man was stabbed, fighting over a parking space. Still another, shot on his way home, carrying a television. Reporters shake their heads over the senseless tragedies that result from Black Friday, but never consider themselves to be a part of the problem. Well, they are, and a big part at that!